Barry and Cathy Beck need no introduction to the fly fishing industry. Barry and Cathy are often referred to as "the first couple of fly fishing". They are on the pro staffs of such companies as Sage Rod Co., Reddington, Rio Fly Lines and Tibor Reels. 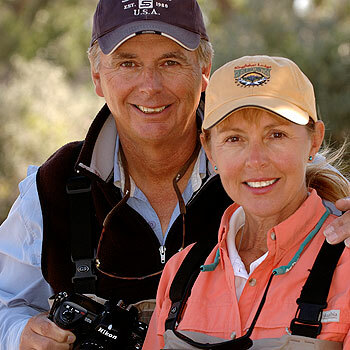 Barry and Cathy Beck have traveled the world fly fishing and photographing their adventures. Learn how their secrets about traveling for fly fishing and how to get the best photographs for youself or your clients. As trip hosts for Frontiers International, they travel to such destinations as New Zealand, Africa, Argentina, Alaska, Bahamas, Mexico, Belize, Venezuela, Mongolia, Russia and the American West, which gives them the opportunity to photograph in a wide range of countries and environments. As photographers, their work appears regularly in sporting calendars and magazines, including Fly Fisherman, Fly Fishing in Salt Waters, Field and Stream, Outdoor Life, Gray's Sporting Journal, Big Sky Journal, Montana Outdoors and others. Commercial clients include Patagonia, L.L. Bean, Sage Rod Co., and 3M/Scientific Anglers. They have provided photography for books by numerous authors and have written and photographed for their own books, which include Fly Waters Near and Far, Cathy Beck's Fly Fishing Handbook, Seasons of the Bighorn, Outdoor Photographer's Handbook and Fly-Fishing the Flats. The Beck's spend their lives in pursuit of fish and photographic opportunities. Cathy Beck has a fly fishing school in Benton, Pennsylvania and has been teaching fly fishing for 25 years. Barry has spent his life in the fly fishing business and photographing. They regularly appear at sports shows and sporting events around the country giving casting demonstrations and presentations on fly fishing and photography.